The Power-Take-Off-driven mower blades travel at speeds of 18,770 fpm for a clean, smooth cut in a variety of applications. It cuts grass before it’s driven over, allowing excellent visibility of the working area. The mower deck cut height can be set from 2 in. to 4.5 in. and can be locked into the raised position when not in use. 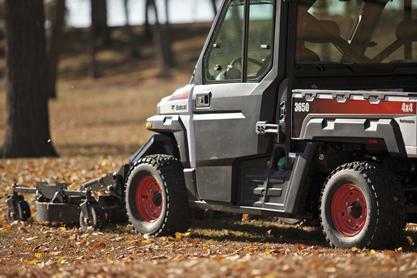 The mower is equipped with anti-scalp wheels that glide over uneven terrain. Mower blades are offset to allow blade overlap so blades cannot contact each other and your lawn looks neat and finished. The mower attachment is front-mounted to the utility vehicle for maximum visibility. The mower is PTO-driven with three offset blades. To control cutting height, the anti-scalp wheels can be raised or lowered ranging from 2 to 4 in. and adjustable in half-inch increments. Wide Side Discharge Deflector: Safely and evenly disperse clippings for a neat appearance. Anti-Scalp Wheels: Floats mower over ground contours and minimizesturf damage while turning. Blade Rotation Indicators: Shows when the mower is engaged. Multi-Attachment X-Change™ (M.A.X.) System: Makes easy work of attaching and detaching the mower from the utility vehicle. Fast and easy mounting means spending less time on attachment changes and more time on the job.